The production of solar power grew by 50% in the Netherlands last year. Wind power production remained the same. The share of renewables in the country’s electricity consumption rose from 15% to 17% compared to the year before. The share of renewables in total energy consumption rose from 6.6% to 7.3%. These figures were released by an official website (www.energieopwek.nl) from the Dutch government tracking renewable energy production in the Netherlands on a daily basis. 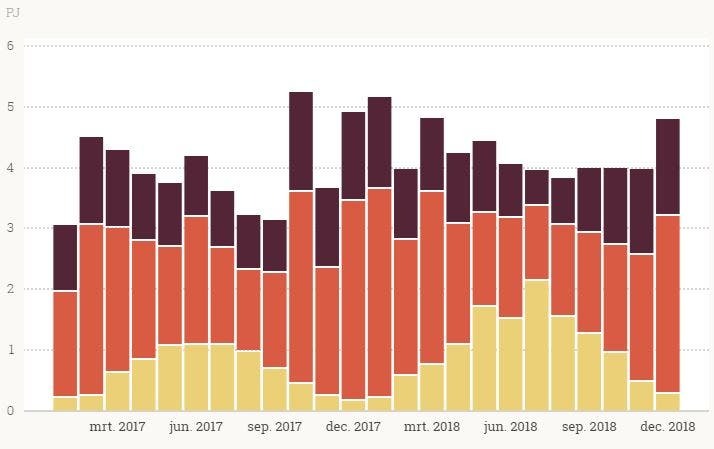 Solar PV production in the Netherlands grew from 2.2 TWh to 3.47 TWh in 2018, about 3% of total electricity consumption. Wind turbines generated some 10.8 TWh of electricity, of which 6.9 TWh came from land, 3.9 TWh from offshore. Wind power, which covered almost 9% of Dutch electricity use, showed no growth because no net capacity was added. The Netherlands has a very ambitious offshore wind program, with a target of 49 TWh in 2030, but this won’t kick in until after 2020. The production of electricity from biomass grew from 4.7 TWh to 5.8 TWh last year. The strong growth in solar PV production was mostly due to large-scale projects, Dutch energy website Energeia (paywall) reports. Solar PV capacity of large-scale projects, registered with Certiq, a state-owned company which issues Guarantees of Origin for renewable energy production, doubled to 1,523 MW in 2018. Total solar PV capacity in the Netherlands grew by 50% to some 4.3–4.5 GW, according to solar specialist Peter Segaar, quoted by Energeia. Households do not register their panels with Certiq, since they have no interest in acquiring Guarantees of Origin. Residential solar PV rose from approximately 2 to 3 GW, Segaar estimates. He notes that the share of large-scale projects in the Dutch market grew from around a quarter to around a third in 2018. An important reason why solar has grown faster than onshore wind is the way the Dutch support scheme (called SDE+) works. It is based on tenders which award subsidies to the lowest-cost bidders as measured against CO2 reduction. Solar PV projects have been overwhelmingly winning the tenders. The good news is that many more large-scale solar PV projects are in the pipeline. More than 6.5 GW of projects that have been awarded a subsidy over the last few years have not been built yet. Most of these projects are still expected to be realized. And this does not include the projects that have participated in the latest SDE+ tender in the second half of 2018. In 2019, two more rounds of SDE+ tenders will follow.